Ahh, the days are flying by! Here's a little bit of life in the in-between. In other words, life according to iphone. 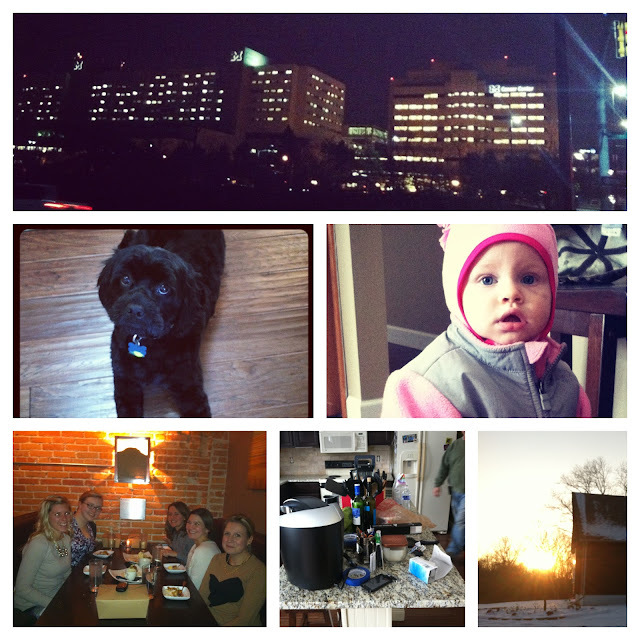 My sweet little dairy via photos at my fingertips. Photos that remind me of sweet memories of days gone by. 1) I was out running errands and drove past the UM hospital, while Kyle was still working. I had a self pity moment, wanting him with me instead. Then I sucked it up, went home and indulged in a chick flick. 2) Maizy and I were out running the other day (did I mention she has been running with me?! She has gone up to 9 miles, and loves it!). Anyway, we ran past a vet clinic which is close to our house. I figured I'd try it out since Maizy was in desperate need of a haircut. Verdict: best haircut she's ever had, but the smell of the clinic may keep me from returning. Based on the look on her face, she was less than thrilled about the experience. 3) Last week, my brother, dad and Hannah came down to help install our backsplash (I'll show it to you this week :). Hannah and I got to hang out all afternoon, chasing each other around the house, bird watching and chatting about life. Those deep conversations with 1 year olds, there's nothing better. That girl continually amazes me. Her 14 month old self is soaking in every ounce of life around her. I was starting a fire in our fireplace (which has become a bit of tradition when I get home from work) and Hannah was watching my every move. While I placed a log on the leftover ashes, Hannah walked to the basket, picked up a piece of kindling, walked over by my side, placed it beside the log, and turned to me with a HUGE smile. Prodigy. She also picked up up a beer from the refrigerator. But that's another story. 5) This is the kitchen mess due to installing the backsplash. Reminds me of demolition week. Thankfully, this only latest a day. 6) The sunsets at our house = incredible.